On April 9, Pope Francis published his third Apostolic Exhortation, Gaudete et Exsultate, subtitled On the Call to Holiness in Today’s World. 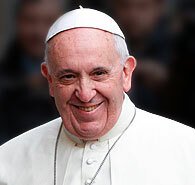 The title is taken from the end of the Beatitudes in Matthew 5: “Rejoice and be glad, for your reward will be great in heaven.” The Holy Father states that his intention in writing the document is to “re-propose the call to holiness in a practical way for our own time, with all its risks, challenges, and opportunities.” This new document is particularly relevant – and exciting! – for the laity, who are called to bring the light of Christ into the ordinary tasks of their daily life in the world. The document is composed of 5 chapters: the call to holiness; two subtle enemies of holiness present in the world today; “in the light of the Master,” Jesus as the model of holiness; signs (or “spiritual attitudes”) of holiness in the world today; and spiritual combat, vigilance, and discernment. Wishing to emphasize that holiness is a call for all the baptized, the pope writes of several examples of saints who lived out holiness in very different ways, such as Francis of Assisi, Josephine Bakhita, Teresa of Calcutta, and Thomas Aquinas. It is in our daily lives as “ordinary” people, the little moments, where we can become holy, particularly in service to others – whether that means living virtuously at home among your spouse and children, welcoming migrants, serving the poor in your area, and other spiritual and corporal works of mercy. Holy lives are shaped by the beatitudes and other virtues proposed by Scripture and Tradition, but choosing to follow Christ can be a battlefield. It is with the help of prayer and the grace of the sacraments that we can become the holy men and women God calls us to be. Below are a few paragraphs taken from the Exhortation. The entire document can be found at the Vatican’s website.